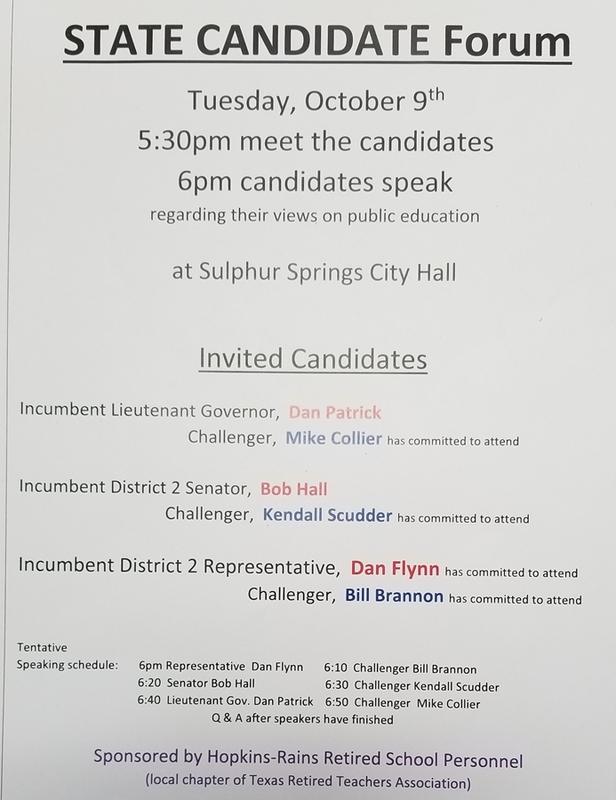 Hopkins-Rains Retired School Personnel are sponsoring a candidate forum focused on Public Education at Sulphur Springs City Hall, October 9th. The event features candidates for Lieutenant Governor, Texas District 2 State Senator, and Texas District 2 Representative. A meet the candidates begins at 5:30 and candidates will speak in turn beginning at 6 p.m.
Each candidate will be given 10 minutes to present their views regarding public education. Order for speakers will be Representative, Senate, and Lt. Governor. Following the candidates presentations, a question and answer session will be conducted. All Democrat candidates have committed to attend the forum–Mike Collier, challenger for Lieutenant Governor, Kendall Scudder, challenger for District 2 Senator, and Bill Brannon, challenger for District 2 Representative. Only incumbent District 2 Representative Republican Dan Flynn has committed to attend. The other two incumbents, both Republicans, Lt. Governor Dan Patrick and District 2 Senator Bob Hall had not committed as of Friday, September 21st. The Hopkins-Rains Retired School Personnel organization is the local chapter of the Texas Retired Teachers Association.